Can you honestly say your prayer life is producing the desired results you are seeking? The Bible says that effective, fervent prayer produces results. So why then are so many Christians failing to see manifestations of what they are praying for? Could the answer be longer prayers, or getting more people to join in and agree with you in prayer? Actually, shorter prayers are the answer if you know who you are in Jesus. For example, when praying for the sick, often a thirty-second, or less prayer, will produce immediate results. It is not the quantity of prayer that bends God's ear. It is understanding your Christian identity as a son of God, and the exercising of your Spiritual Authority bestowed on you through the mighty name of Jesus Christ. 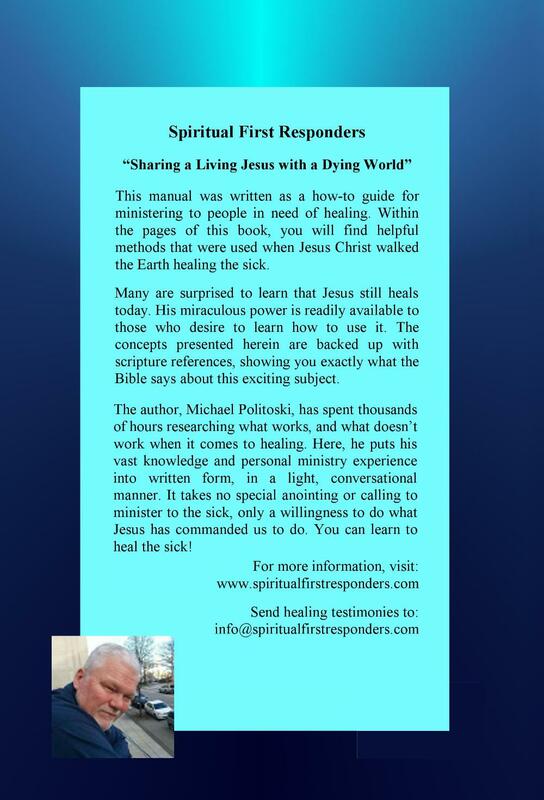 The Spiritual First Responder Training Manual takes you step by step through the ministry process, so you can see positive results in your prayer life. Within the ten chapters of this manual, you will gain valuable insight into your relationship with Jesus, and what He expects us to accomplish for Him as believers.